Supermarket chain Asda has predicted another year of "intense pressure" for the struggling sector as the global economy remains "turbulent". Asda boss Andy Clarke said he would sink another £500m into the price war with his rivals, as part of "radical action to win back our customers". The move comes at the start of a big week for the grocery trade. The other big UK supermarkets - Tesco, Sainsbury's and Morrisons - are set to unveil Christmas trading figures. Asda, which is owned by US chain Walmart, does not release its figures until February. However, Asda appears to have been suffering more than its rivals, with analysts viewing it as the most vulnerable of the big four to discount stores Aldi and Lidl. 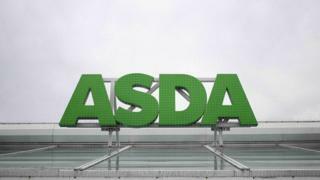 Asda's latest price-cutting investment is in addition to £1bn of investment announced in 2013 and due to be rolled out over a five-year period. Mr Clarke said: "The structure of UK grocery retailing has permanently changed to reflect the way that customers shop today." He described the change as "a global phenomenon", adding: "We saw the change coming and responded in 2013, but we didn't move fast enough." Conditions in the UK grocery market are particularly gruelling, with all of the big four chains struggling. Morrisons, which reports its Christmas trading results on Tuesday, saw a 2.6% fall in its like-for-like third-quarter sales. The retailer dropped out of the FTSE 100 list of the UK's most valuable companies in December. Tuesday also sees the publication of the latest Kantar Worldpanel figures indicating the relative size of retailers' share of the grocery market. Sainsbury's, which publishes its third-quarter and Christmas results the following day, saw a 1.6% fall in its like-for-like first-half sales, which strip out the impact of new store openings. Tesco's third-quarter and Christmas results come out on Thursday. In the first half of the financial year, its UK like-for-like sales were down 1.1%. As for Asda, its like-for-like sales fell 4.5% in the three months to the end of September, marking its fifth consecutive quarter of falling revenue. Retailers including Marks and Spencer and Waitrose have already released their figures for trading over the Christmas period. Last week, M&S said third-quarter sales of general merchandise were down by 5.8% for the 13 weeks to 26 December, although food sales were up 0.4%. It also said chief executive Marc Bolland would step down in April, to be succeeded by Steve Rowe, executive director of general merchandise. Like-for-like sales at Waitrose supermarket, which is part of the John Lewis Partnership, fell 1.4% over the Christmas period, although John Lewis sales overall rose 5.1%.